Day 3. I’ll be seeing a lot of this sign. Looks like it could use an update, but hey, who’s counting. Also, I realized yesterday that my wife was correct – my face is fatter. Not that I’ve gained any real weight in two days. I think it’s more a function of all the sodium I’m consuming. Water weight, I swear. I went to the gym this morning for the first time in a month, and I will be continuing to go to the gym throughout this process. I don’t want to end up like the McDonald’s guy. 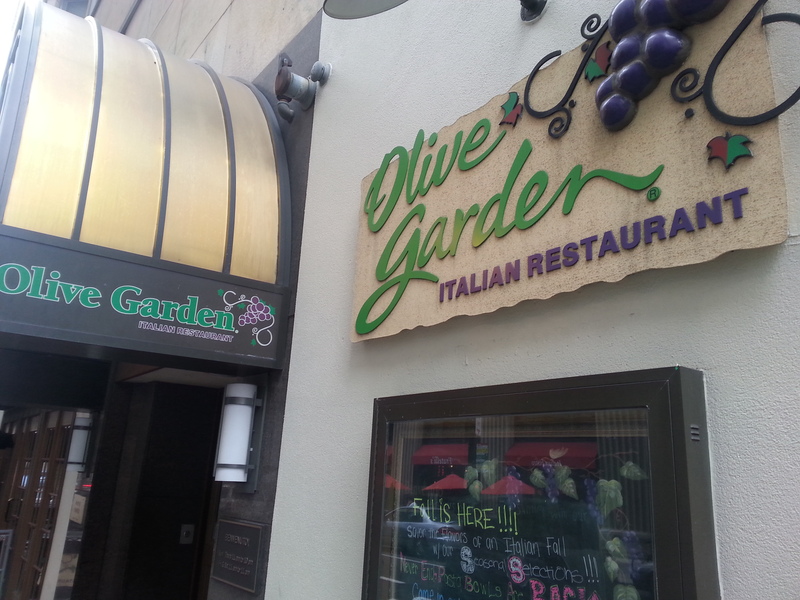 I’d much prefer to be the Jared of Olive Garden. Realistically, neither one of those is happening. I don’t know if it’s a coincidence, but my wife also informed me this morning that she signed us up for a 5k this weekend. Meh, who knows what that even means. Americans only use the metric system when they want to make something sound more impressive than it is, so I’m guessing it’s a pretty short distance. In any case, I have that date marked as the day I will be venturing into the Alfredo sauce side of this experiment. 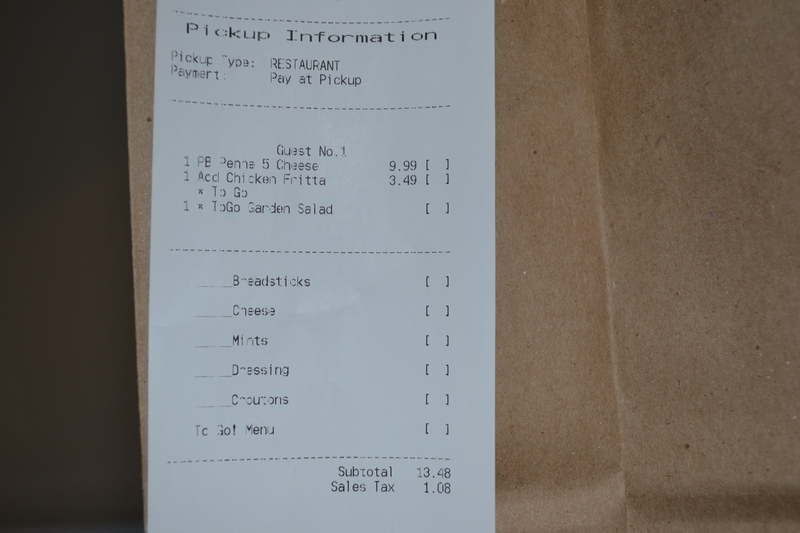 My meal would have been $14.56 including tax! I definitely don’t have to do this ten times to make it “worth it” monetarily, but obviously this isn’t about money. This is a story of true love. This is about dedication, consistency, and loyalty. In short, this is a marriage. A 49-day marriage. So more of a Dennis Rodman marriage, I suppose. I was pleasantly surprised with the takeout package. 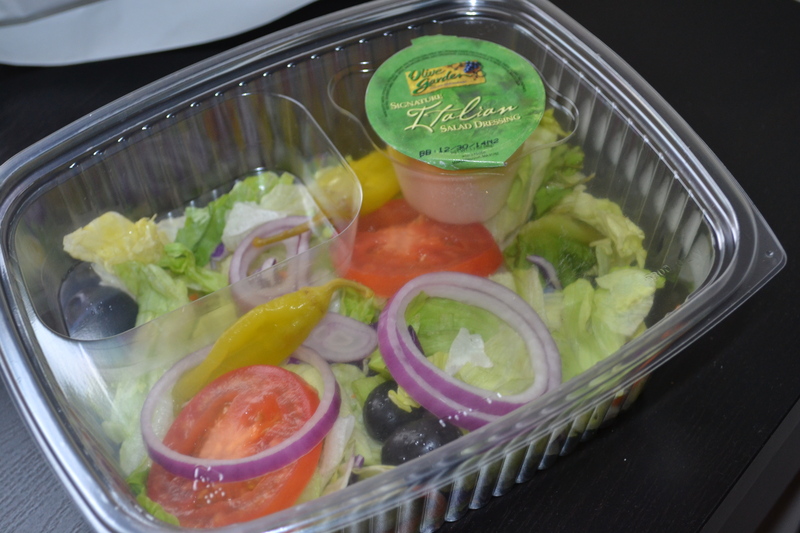 The salad came in this nifty little plastic box with the famous OG dressing in this little keurig looking cup. It must have taken the chef forever to make the dressing from scratch, portion it out into these little containers, then somehow seal them. They must have one of those machines that bubble tea places have that seals little plastic containers. Those damn pepperoncinis again. To be fair, I haven’t actually tried one yet. Maybe tomorrow. 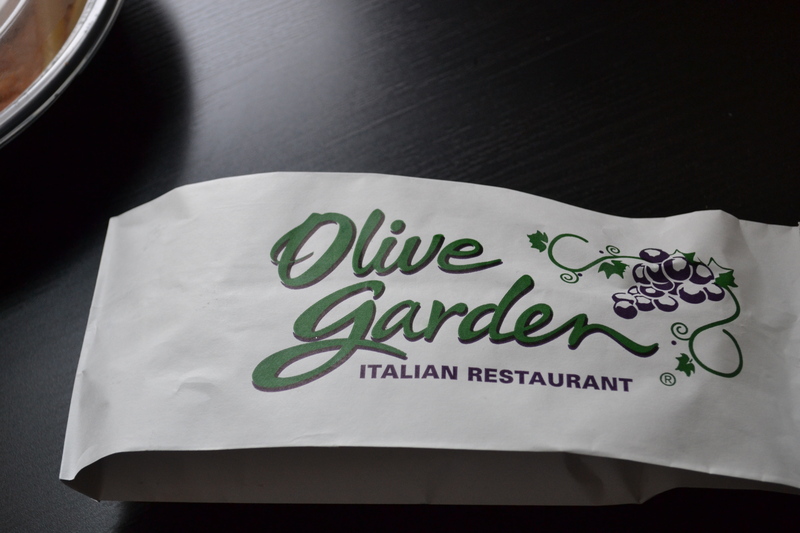 Breadsticks come in this foil-lined bag. It’s about a fifteen minute walk from the OG to my house, so way over the seven-minute time limit you have to eat your breadstick before they deteriorate in quality. I took a bite out of one just to see how much they actually deteriorate. Big mistake. Let’s just say that, in Christ-like fashion, I have sacrificed myself so that everyone else can be saved from cold, stale breadsticks. Luckily, OG has a solution! 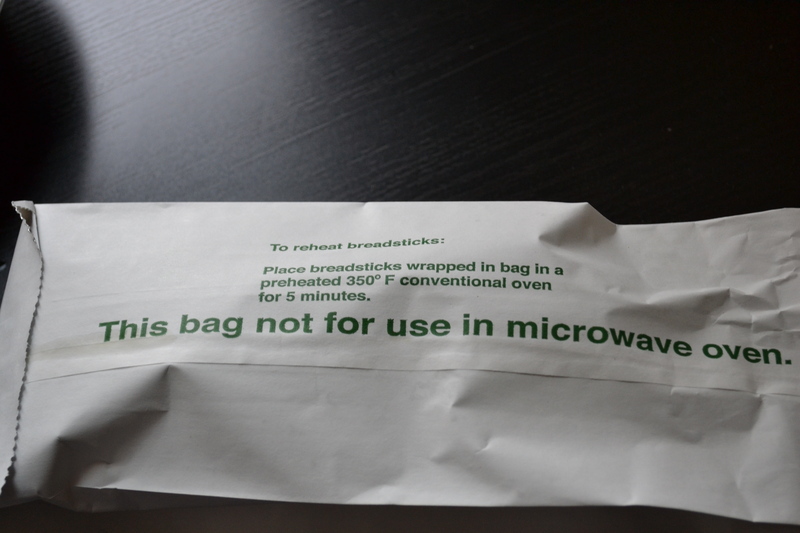 You preheat an oven and… well, if you can read this blog, you can read the instructions above. 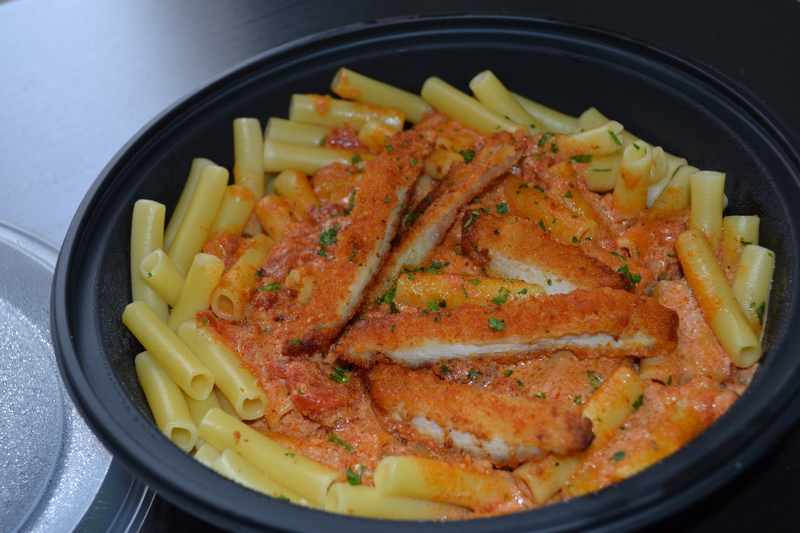 The penne with five-cheese marinara and chicken fritta. 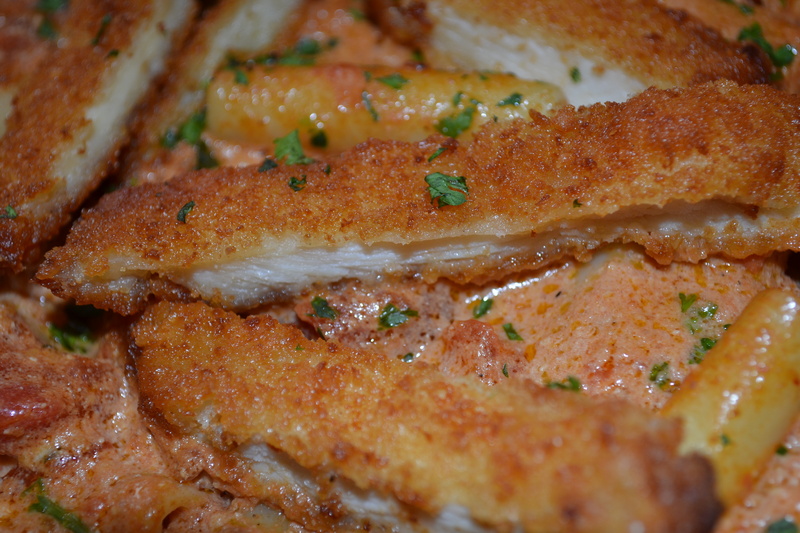 The chicken fritta was superb, though not quite as ethereal as the shrimp. I overheard the manager talking about how the Sultan of Brunei gifted a flock of his best chickens to his good friend Silvio Berlusconi, who in turn took the chickens to his ranch in the South of Italy. 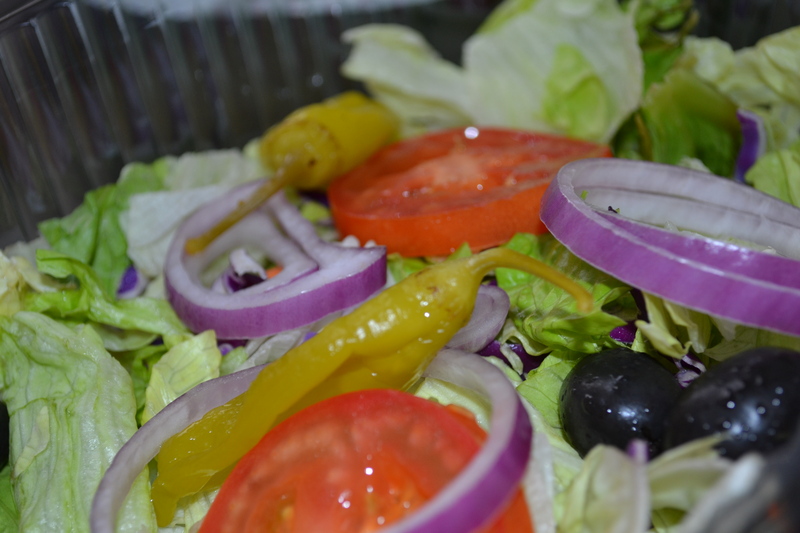 There, one of his many girlfriends tended to the chickens with love for many months before sending a select few to the Center City location of the Olive Garden. This chicken fritta came from that special flock, and it really showed in both the flavor and the moistness of the chicken. You know what else was a pleasant surprise? The five cheese marinara sauce! I’ve seen cheese-flavored marinara at the store before, but I never tried it since it seemed somewhat pointless, given the mountains of parmesan cheese I always throw on top of my pasta anyway. Today was different though – since I was getting takeout, I knew I wouldn’t have access to the OG’s army of cheese-machine wielding servers, so I decided to give the cheesy marinara a shot. It. Was. Awesome. It’s more like cheese sauce with a hint of marinara than the other way around. Hahahahahahahaha!!!!!!!!!! Best blog ever. I need to see the sodium bloated facial pics! I love this. Best entry yet. Your cost per pasta bowl makes no sense? I have never seen a bowl of pasta for $30 plus dollars. I’m calculating my cost per pasta bowl based on the fact that I paid $100 for the pass, and leave either $2 or $5 as gratuity depending on if i get takeout or if I eat in. So by day three, I had spent $100 on the pasta pass and $12 on gratuity, so dividing $112 by 3, my current cost per pasta bowl at that point was about $37.